Frizzlefry Blog: Here is an update! So, I pretty much dropped off the grid for the past week. I guess I just got a little caught up with work, and a few side projects I'm working on. One thing I've been doing lately is making a financial tracking spreadsheet that has nifty little tools and charts that I can use to manage my money. I like it so far, but it has kept me a little occupied lately. One thing I've been doing every day is walk on the trail. I was happy to see this bird that is living in one of the trees above the trail. It is flying around all the time, and it doesn't seem too bothered by the dogs or people. 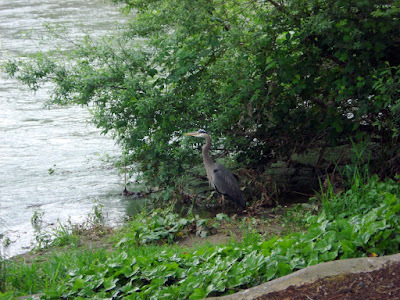 The bird feels quite at home on the river, with lots of food and fresh water for the bird, and the locals don't disturb it. I also got my computer to display full resolution on my TV. The TV only accepts 2 resolutions, a 16:1 perspective and a 4:3 perspective... with only one resolution for each perspective. anyway, I couldn't get it working in windows, but it works fine in Linux. The only bad part about that is that I can't use the Zune software in Linux. This is the bad part about working on a Windows only product. Grr. I guess other than getting my computer working the way I want it to on my TV, and creating a document to help me manage my money, I have been thinking about getting a Asus Eee. It's a "netbook" or "cloudbook". The concept is very much like the Apple Air, but much more affordable. A netbook/cloudbook is a little laptop. They typically don't have large hard drives, and they are intended primarily for internet usage. The model of Eee I was looking at is one that includes a built in webcam. It has a 4GB solid-state HDD, and 1.7 Ghz Atom processor. 7" screen, and keyboard. They are usually a little smaller than a standard spiral notebook, and they are usually under 2 lbs. The Eee I'm looking at actually has no moving parts. However, I don't think I'll have an extra $500 for a little while, so I will have to wait on one of those. The weather last week was just so... depressing. Everyone was depressed and angry that it was raining with strong winds. It was really nice that on Thursday the weather got really nice, and it's been pretty nice sense. I guess the clouds were out today, but the sun came out a few times. It's definately good weather. Anyway, I'm going to get to bed. I'll be sure to update again soon!